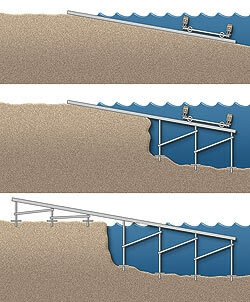 Roll-A-Rail offers a convenient way to fully protect your boat from water and weather damage. The ease of removing your boat from the water facilitates visual inspection of the entire hull and simplifies periodic maintenance or repairs. Roll-A-Rails are used for boats, pontoons and even float planes. Roll-A-Rail systems are built to Hewitt’s exacting standards and are constructed from corrosion resistant structural aluminum. To read more about our Roll-A-Rail product please view the manufacturer’s website.